Oh strawberry pie, how have I never heard of you or thought that you might be the most delicious concoction I've ever tasted? I just don't know, but I sincerely apologize for neglecting to make you until now! 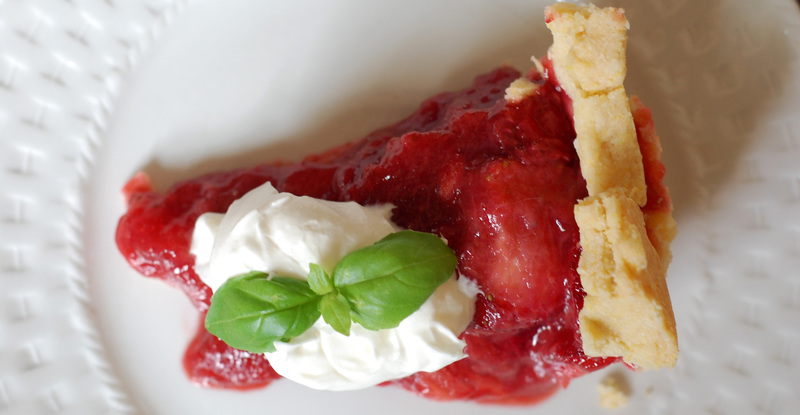 If you've never had strawberry pie (obviously, I hadn't - I know, I must be living in the hole), please run, don't walk, to the grocery store and/or market to get the supplies for this most scrumptious dessert! I promise, you'll be wondering why you waited so long to make this! Last week after returning from the National Stationery Show in NYC, we were driving by Mom's Apple Pie in Leesburg and there was a giant strawberry cutout sitting by the side of the road and a sign for Strawberry Pie in the window. We meant to stop, but then forgot, but once I remembered, I couldn't get the thought of strawberries nestled inside a pie crust out of my head, so I had to find a recipe STAT. Here's the recipe I put together using a strawberry pie filling recipe from Cook's Country and my Cornmeal Pie Crust. Crust I used my Cornmeal Pie Crust recipe. Bake pie crust shell and let cool. Combine lemon juice, water, and gelatin in small bowl. Let stand until gelatin is softened and mixture has thickened, about 5 minutes. Stir gelatin mixture, sugar, and salt into cooked berry mixture and return to a simmer, about 2 minutes. Transfer to bowl and cool to room temperature, about 30 minutes. With electric mixer on medium speed, beat cream cheese, sugar, and vanilla until smooth, about 30 seconds. With mixer running, add cream and whip until stiff peaks form, about 2 minutes. Serve pie with whipped cream topping. I like to add chiffonaded basil or mint to the cream to give it an additional flavor profile.